Gold futures turned lower Thursday, posting their fifth loss in six sessions. Silver also fell, slipping from a 23.5-month high, while platinum and palladium gained as a pair for a second day in a row. Gold for August delivery declined $11.40, or 0.8%, to settle at $1,332.20 an ounce on the Comex division of the New York Mercantile Exchange. 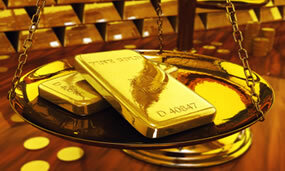 Gold futures ranged from a low of $1,320.40 to a high of $1,348, after rising 0.6% in the prior session. "Britain has got a new prime minister, which, alongside expectations of more stimulus from the Bank of England, has brought a sense of relief to markets, so gold is easing and everything else is rising on that," Reuters quoted Citi strategist David Wilson said. "But the whole process of Brexit negotiations, which hasn’t started yet, implies financial risks that will be supportive for the metal in the medium term." Silver for September delivery shed 9.1 cents, or 0.5%, to settle at $20.322 an ounce. Silver futures traded between $20.06 and $20.62. On Wednesday, they jumped 1.2% and ended at their highest level since July 30, 2014. October platinum rose $4.40, or 0.4%, to $1,104.60 an ounce, ranging from $1,084.20 to $1,105.50. Palladium for September delivery gained $6.90, or 1.1%, to $651.10 an ounce, trading between $636.65 and $652. Gold fell $19.15, or 1.4%, to $1,323.60 an ounce. Silver shed 4 cents, or 0.2%, to $20.25 an ounce. On Monday, the U.S. Mint set its latest weekly allocation of American Silver Eagles to 3,649,500 coins. Bullion distributors ordered 12.2% of them through Thursday. Although their sales have slowed in recent weeks, 2016 Silver Eagles are still tracking toward an annual record with 26,945,500 sold. The figure represents a 10% increase over those sold through same time in record-breaking year 2015. On Monday July 11, US Mint spokesman Tom Jurkowsky said the US Mint is no longer experiencing shortages of silver blank planchets for the ASE bullion $1 coins from its outside vendors. Many of the Mint’s Authorized Purchasers have been buying the ASE $1 coins in the secondary market instead of from the Mint recently as investors sell them the coins to take profits since silver went over $20 recently. Therefore the Mint has experienced a major drop in sales of the ASE bullion $1 coins & has more than 3.6 million of the coins unsold from previous weeks & available for purchase this week. The new 2016-P 5-ounce silver Harpers Ferry vapor blast version coin went on sale today at noon Eastern time from the US Mint.